Pugs are one of the most popular small dog breeds of today and if you are looking for the best dog food for Pugs then you have come in the right place! Our list below will tell you all about the best foods for your Pug and Pug puppies to start them off on the right path as of today, and also explain why these premium brands were chosen among the top foods for Pugs. First Five Ingredients: Deboned Turkey, Turkey Meal, Chicken Meal (source of Glucosamine and Chondroitin Sulfate), Potatoes, Peas. 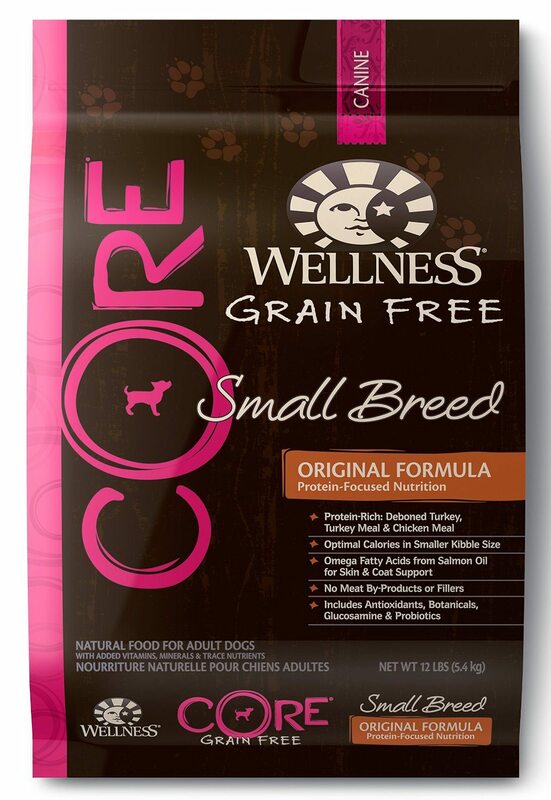 Wellness CORE Original Recipe for Small Breed with Deboned Turkey, Turkey Meal & Chicken Meal is a grain-free option for dogs that focuses on complete, balanced nutrition using the best ingredients. This recipe includes turkey and chicken as premium sources of protein along with fruits and vegetables like blueberries, broccoli, and sweet potatoes. These wholesome, natural ingredients are supplemented with everything else dogs need to thrive. Similarly to our first choice, this blend too is high in proteins and low in fats (36% crude proteins & 16% fats), with 396 kcal/cup. Essential vitamins and minerals protect dogs’ immune system functioning, while fatty acids protect dogs’ skin and coat health. Probiotics, prebiotics, and fiber work together for ideal digestive health. Essential nutrients protect dogs’ eyes teeth and gums. High quality proteins and carbs give dogs the energy they need to be active and playful. This recipe is also free from corn, wheat and soy. Owners love Wellness CORE because it is a healthy blend that helps them maintain their dogs’ weight hence why it's ranked in the top two pug best food list. The fact that this food is grain and gluten free is great, because it makes the perfect food for Pugs with allergies and skin conditions. First Five Ingredients: Deboned Lamb, Lamb Meal, Sweet Potatoes, Peas, Pea Starch. Many dogs suffer from food allergies and the Pug is not exempt. 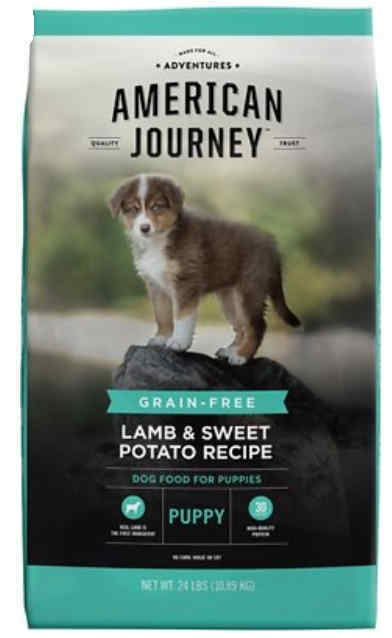 If your Pup has a sensitive stomach or he suffers from food allergies or food intolerance, consider this American Journey LID Grain-Free Lamb & Sweet Potato kibble. Made using just a limited number of quality ingredients to reduce the risk for triggering allergic reactions. 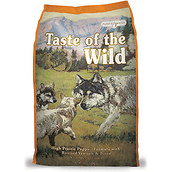 It is a grain-free kibble without any chicken or chicken meal in the recipe, using deboned lamb as the main protein. Lamb is a great substitute to poultry since it's high yet a leaner source of protein. Lamb meal is added along with some other key nutrients such as flaxseed, fish oil and canola oil as a concentrated source of energy. Sweet potato is a complex carb that is easy to digest and peas are a source of both protein and fiber. This product is formulated for all life stages. This recipe also contains a plethora of vitamins and minerals. We'd have liked to have seen a few more fruits and veggies added but since this is a limited ingredient diet it's formulated to combat allergies while still providing a balanced diet. Dogs seem to love the taste and texture of this kibble, including pugs with the main reviews pointing to clearing up skin irritations, weight maintenance and firmer stools. This food has only 330 kcal/cup. American Journey is our best value food for clearing up allergies in your Pug that is both affordable and tasty for dogs too! It is Chewy's own in-house brand, currently offering 50% off the first bag, its recipes are made in California, USA and you can choose from four other tasty LID formulas, including Duck, Salmon, Turkey or Venison. Orijen was voted Pet Food of the Year for the last three years because of their focus on healthy, natural dog food. Their adult dry dog food blend has 80% meat ingredients and 20% fruits and vegetables to give dogs the protein and nutrients that they need to live healthy, active lives. Orijen is also grain free, which means that it is better for pugs and won’t trigger any allergies or skin sensitivities. This formula offers 38% crude protein and 18% fat, plus it has an array of essential amino acids. 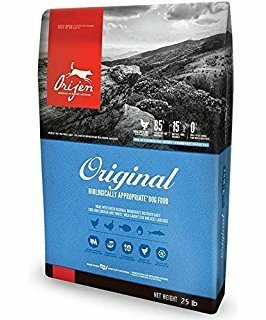 Some ingredients in the Orijen Original formula which dog owners love include fresh chicken, turkey, whole eggs, mackerel, green peas, pumpkin, carrots, apples, and spinach. This blend has everything that dogs need from Omega 3 and 6 fatty acids for skin and coat health to glucosamine and chondroitin, which are good for dogs’ joints. It has 470 kcal/cup distributed to support peak conditioning: 39% from protein, 19% from vegetables and fruits, and 42% from fat. 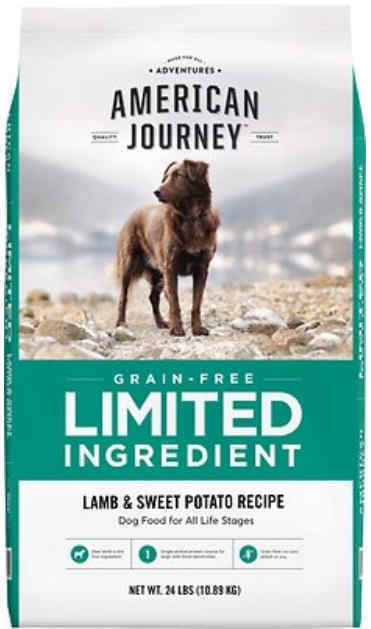 This recipe comes highly rated by dog owners on Amazon and DogFoodAdvisor.com with picky dogs who couldn’t stick to any brand before landing on Orijen. A lot of people have had success switching their dogs to this food to rid their furry friends of allergies, skin issues, and digestive problems. 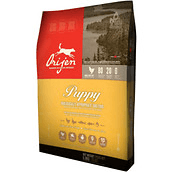 To their relief, Orijen did the trick thus we class this brand as the best food for pug dogs. First Five Ingredients: Chicken Meal, Ground Whole Brown Rice, Ground Whole White Rice, Oatmeal, Chicken Fat (Preserved with Mixed Tocopherols). 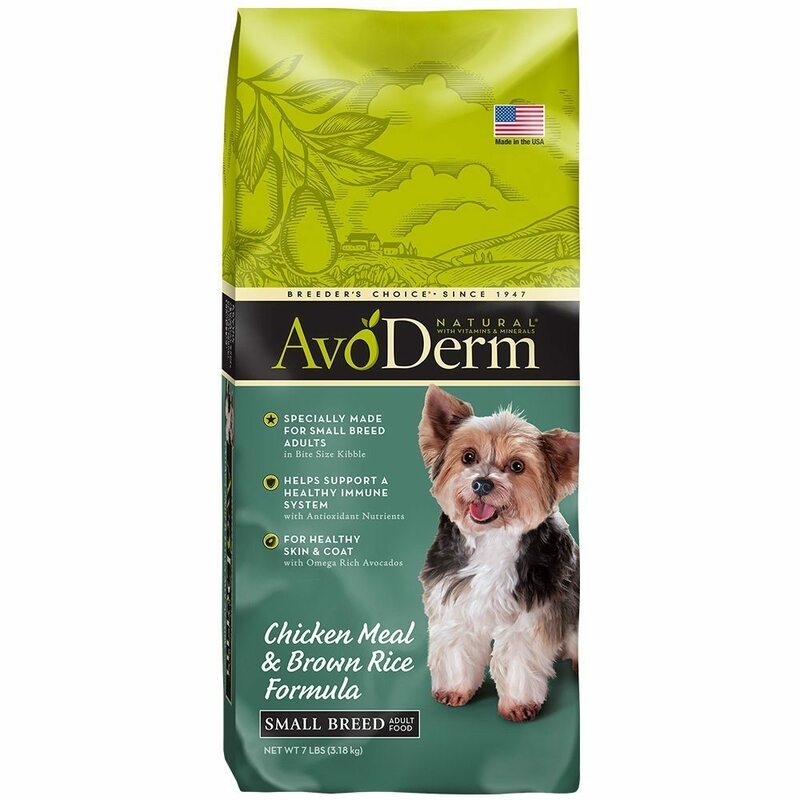 Our next recommendation coming in at #3 on our list of best dog food for Pugs is a product from AvoDerm which is considered to be a premium dog food brand yet very affordable, namely AvoDerm Small Breed Adult, Chicken Meal and Brown Rice Formula. This formula is suitable for Pugs under 20lbs in weight and comes packed with high-quality protein such as chicken meal, whole grain carbs in the form of brown rice and oatmeal. Its secret ingredient lies in the use of avocado which helps to promote your Pug's skin and coat condition while also supporting the healthy development of their immune system. Hence why it is also an ideal formula for feeding a growing pug puppy with it. This food has 354 kcal/cup and contains 26% crude proteins and 16% crude fats. All in all, AvoDerm Small Breed Adult dry dog food is an excellent option for your Pug if you don't feel like spending that much on our first recommendation. This formula is also free from artificial additives, corn, wheat and soy which makes it the best dog food for pugs with allergies and other skin conditions. First Five Ingredients: Chicken Meal, Whitefish Meal, Oatmeal, Ground Barley, Ground Brown Rice. Another great choice of food is Earthborn Holistic Small Breed formula, its primary protein source is chicken and its primary carbohydrate is oatmeal. 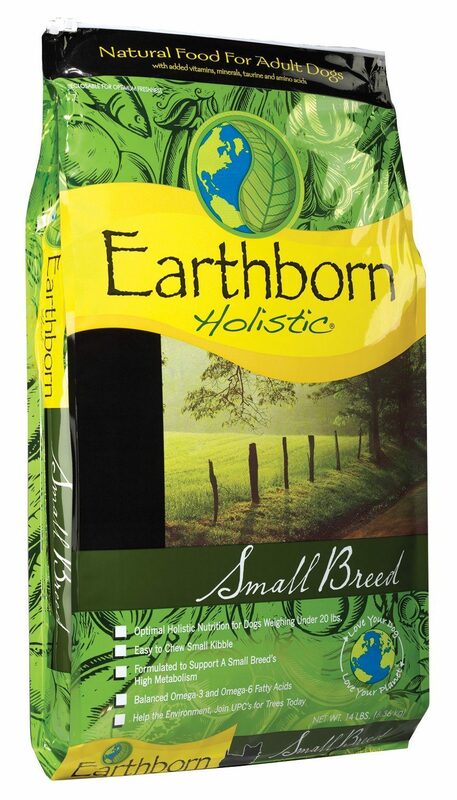 Earthborn Holistic has several great dog food product lines. We like this formula since it provides all the complete nutritional needs of smaller breeds like Pugs. It has 28% crude proteins and 17% crude fats, with 425 kcal/cup. In addition this food also includes whitefish meal, rice, barley, oatmeal and rye and rich fruits and vegetables. The addition of L-carnitine will help support lean muscle mass while Omega 3 and 6 fatty acids will ensure your Pug's skin and coat remain healthy and shiny. Overall this formula makes for a good grain-free and easy to chew kibble for your Pug and comes highly recommended on Dog Food Adviser and Amazon. First Five Ingredients: Brewers Rice, Chicken By-Product Meal, Brown Rice, Corn, Corn Gluten Meal. Royal Canin is a popular brand with a plethora of positive reviews from other Pug owners. Not known for its highest quality ingredients used, it contains gluten, corn and soy nonetheless this formula was designed with pure-bred Pugs in mind. Proteins are at 23% and fats are 14%, with 314 kcal/cup which is nice and low since Pugs can also easily gain weight. 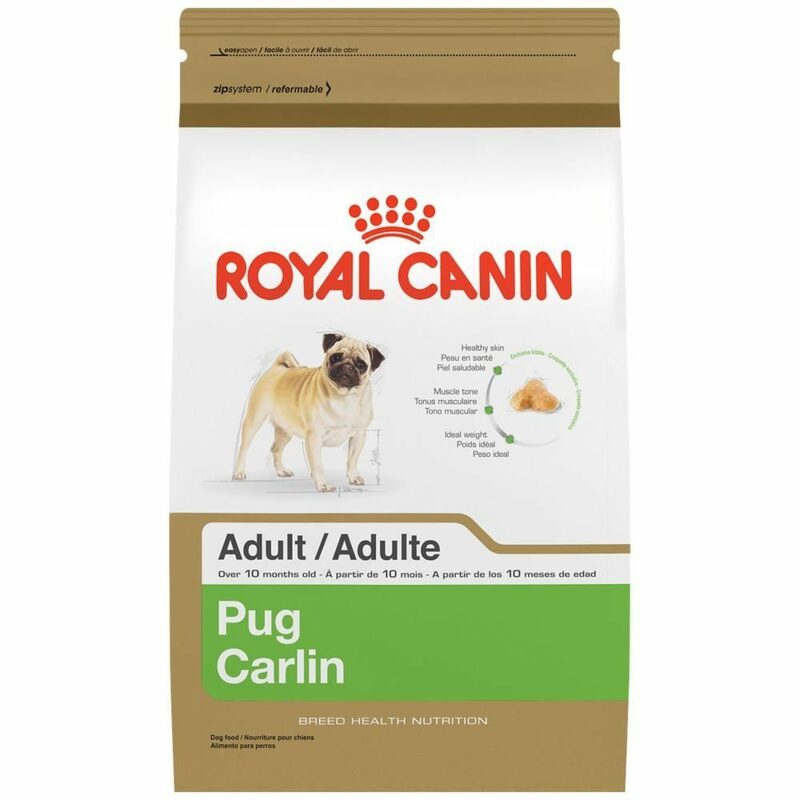 In it’s defense, despite its lackluster ingredients, Royal Canin Pug Food does contain a high protein content, fish oils and probiotics for digestive health, in addition to a whole range of natural additives, extracts and essential trace elements. We like to see meat as the first ingredient in a kibble, in this recipe it comes in second. Saying that chicken by product meal is a good source of Glucosamine and Chondroitin Sulfate. Despite its popularity and affordability over some of the other premium brands we would still recommend one of the more premium brand foods mentioned above. What is the Best Food For Pug Puppies? The ideal Pug puppy food amount is approx. 1 ounce or 28 grams per each pound of body weight with a calorie intake of 50 calories per pound of body weight and should be fed at least three times a day. What food should a Pug pug eat? Obviously they cannot start on the same dog food as adults. We recommend the brands and recipes below as the best food for pug puppies of 2019. Pugs are a small breed that people either love to death or find a little strange looking. Pug lover finds them adorable, with their soulful, beady eyes and cute squished-in faces. They make entertaining and lovable companions for families with children or singles, and can do well in large or small spaces. The Pug is a very sociable dog, but quite stubborn. The breed even has its own motto associated with it: “multum in parvo” (a lot [of dog] in a little package). The Pug is a popular breed for a housepet, as it is easy to groom (though it sheds substantially more than other dogs of similar size). However, a pug likes to consider himself the boss. Therefore tiny children who do not understand how to correctly treat the pug can cause the pug to be scared, defensive, or shy. Pugs are true “lap dogs”, in that they most often want nothing more than to curl up in their owner’s lap (and perhaps a snack). 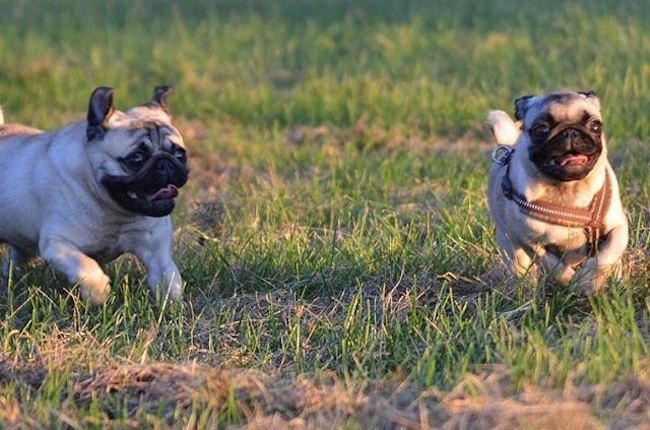 They require regular exercise, and some Pugs will walk for an hour or more. When exercising a Pug, however, it is important to make sure they do not overheat, as their short noses do not cool them off as easily as those of longer-nosed breeds. Pugs are generally compatible with most children and other animals. Some Pugs, like many dogs, suffer from separation anxiety; that is, when they are left alone, they bark and whine. Pugs are capable of being trained to stop their crying. If you are a Pug lover you are going to enjoy this video compilation, so sit back and relax. Pugs can be quite lazy dogs if you let them, so owners should make sure their Pugs get daily exercise. This could mean taking a walk or playing games inside to avoid the heat on warmer days, since Pugs are sensitive to heat. To make sure that they lead happy and healthy lives, Pug owners should make sure they feed their dogs premium brands that have healthy, natural ingredients. Pugs aren’t very picky when it comes to their diet, but their owners should settle on a brand whose main ingredients consist mostly of meat, fruits, and vegetables. Keep in mind that ingredients lists go in order of quantity, so if fillers like grain and wheat are the top ingredients it could lead to poor health, digestive issues, and allergies for many dogs. How to get a pug to lose weight if it's obese? Well, the ideal diet for Pugs contains meats (chicken breast, fish, liver) as the main ingredient, followed by healthy starches (brown rice, baked potato), vegetables (green beans, peas, carrots, broccoli) and fruits (the berry variety, bananas﻿, pumpkin). Premium dog food brands make sure that dogs have everything they need for complete health like whole, natural ingredients, vitamins, and minerals. The top five brands we mentioned above come highly recommended by numerous dog owners who have seen significant health improvements after switching to these brands. How To Feed Your Pug? Small dogs can be fed two meals a day, once in the morning and once in the evening. Since they are a smaller breed, owners can also choose to only feed their Pug once a day. Owners should start by consulting the information on their dog food, following the feeding instructions based on their dog’s weight. 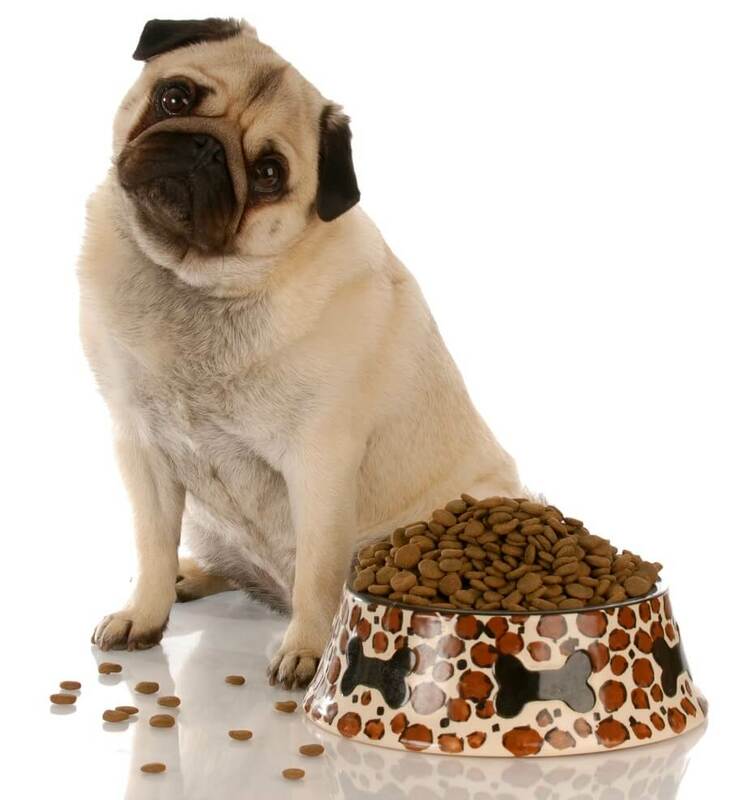 Owners should feel comfortable adjusting their dog’s portions based on their activity levels and age, but they should be careful not to overfeed their Pugs. For proper nutrition, it is also important that dogs should always have fresh, clean water available. If owners ever have any questions or problems when it comes to feeding pugs, they should feel comfortable contacting their vet for more advice. How Much Food Should a Pug Eat? Pugs should not have food available all the time, because if they become overweight it can contribute to worse health problems in the long run. Pugs often suffer from joint problems if they become overweight, because of their body to leg ratio. So in terms of how much should a pug weigh? Well, the ideal or average pug weight for males is 14- 19 pounds and females being between 13 -18 pounds. The recommended calorie guideline to feed Pug adults is around 40 for each pound of body weight and should eat 1/2 ounce per pound of weight once a day in addition to some healthy snacks. Owners should decide to feel their Pugs either one or two meals a day and try to stick to a routine once they find one that works. They should always measure their dog’s food to make sure they are getting properly fed and healthy. Eye Concerns and Skin Allergies: Because they have extremely short snouts and no skeletal brow ridges, Pugs can easily scratch their corneas (corneal ulcer) or puncture their eyeballs. Their short noses can also cause them to develop breathing problems. They are also prone to skin infections if the crevices in their faces are not kept clean. Additionally, Pugs may be prone to skin allergies, which if not treated can lead to infection as the Pug scratches the inflamed areas. The breed’s characteristic flat face may also contribute to tooth and mouth problems. Pugs typically love to eat, and so are prone to obesity; they can quickly reach unhealthy weights. If you own an obese pug ensure they get enough regular exercise and be more restrictive with their diet. Most premium dog food blends contain ingredients like Omega 3 and 6 fatty acids to help with dogs’ skin and coat health along with other ingredients that contribute to healthy eyes like carrots, kale, broccoli, blueberries, and sweet potatoes. Overheating: Due to their short snouts, Pugs are vulnerable to temperature extremes. It is important to make sure that they do not overheat in hot weather, and likewise they should not be left outside in very cold weather. They also have problems swimming and can drown if left unattended near a pool. So watch out for the warning signs. Some symptoms of overheating that could lead to heatstroke are heavy panting, glazed eyes, excessive thirst and increased body temperature. Pugs can also suffer from a chronic form of granulomatous meningoencephalitis (an inflammation of the brain) specific to the breed called Pug Dog Encephalitis (PDE). PDE is estimated to occur in 1% of Pugs. There is no known cause or cure for PDE, although it is believed to be an inherited disease. PDE is invariably fatal. All dogs either die or are euthanized within a few months after the onset of clinical signs. Joint problems: Pugs sometimes suffer from joint problems like hip dysplasia, which is an inherited disease that affects the ball and socket of the hip joint. It can be hard to tell if a Pug has hip dysplasia unless they hurt themselves somehow, but some symptoms include limping, hind leg stiffness, and trouble with stairs. Owners can take preventative measures in this situation by feeding their Pug dog food that contains joint-protecting ingredients like glucosamine and chondroitin and dog ramps to help them get into cars or jump onto furniture without causing further injuries.